The Arrows are definitely an extremely useful Card in Clash Royale. They often jump in and out of the game meta, due to occurrences such as the buffs and nerfs of similar spells or Cards such as Zap and Ice Spirit, which can be seen to offer far more value for less cost. However, the Arrows have their own quirks and advantages that make them unique. The Arrows have relatively low damage, and low Elixir cost. Their wide range is very beneficial when eliminating swarms, and therefore open the gates for many more strategies to be employed during utilisation of this spell. They can be used to chip towers, but do not provide high damage for this particular technique! They can eliminate swarms several levels above the Card itself! 2/2/16, Arrows damage decreased by 4%. 19/2/16, Crown Tower damage decreased by 20%. They can be used against swarms or hordes, such as Minion Horde, Goblins and more. They are very effective against spawner Decks, due to the buildup of troops. After sending in a Hog, Giant, or other tank Card, you can eliminate the entire set of Spear Goblins or Skeletons that may have resulted from the continuous spawn and distraction of units on the enemy’s side of the Arena. This can lead to a huge Elixir advantage, and can also shutdown pushes involving built up swarm troops following a strong tank (e.g. Giant + Spear Goblin swarm). Stronger units such as Hog Rider, Valkyrie and Musketeer can be finished off using the low damage of the Arrows. They can chip damage of these units too, but this method is best used only in emergency situations to mitigate damage. Arrows can be utilized against the Ice Spirit and Spear Goblin combo. When a player deploys several Spirits, a Hog or Giant and some other cheap support Cards, it is fairly easy to lure over the tank and Arrow the other offensive troops. This can result in you clearing the enemy’s push very quickly and efficiently. The ‘lure and cure’ strategy or manoeuvre is one I have devised myself. It is uncommon to see but amazingly powerful, and can lead to insane Elixir advantages. By placing a cheap troop, namely now the Ice Golem (any of the Goblins will do too), or basically any small anchor point troop, in the center, you can diverge the attention of both lanes. This can be used against common SKArmy and Minion Horde combos, meant to confuse the enemy. Then, once the Cards near the center, cover the area in Arrows, and voila! This is a great technique for countering split-lane bait pushes, and if timed correctly you will conceive no damage at all! Predictive Arrows are a clever move, best used once your enemy has cycled once or twice and you can judge what they will drop next. This can give you a huge advantage in many battle situations, catching your opponent unaware and eliminating their pushes (e.g. when you deploy Mortar, Minions are almost always dropped first), or their counters (predictive Arrows work well against Goblins, Minion Hordes and more! ), to again leave you with the clear upper hand! The Arrows are a standard and completely even Elixir trade move against the Princess. This can help mitigate lots of damage. It is sometimes best to allow her one shot, wait for a tank to be dropped, and Arrow them both for optimum output/effect! Using Arrows to weaken medium-low HP Cards can prove to be extremely beneficial during several different circumstances. For example, Barbarians may be coming in, but you have no Fireball. Arrowing to cycle to a Cannon will result in weakened Barbarians, and with the right Cannon placement, your Tower can kill one Barbarian, and the rest will be eliminated by the Cannon – after which it should still be sitting at around ¾ health or more! Freeze + Arrows is a ridiculously deadly combo that I have seen used on many occasions in battle. By Freezing troops like the Minions, Goblins and Spear Goblins, and even weakened Witches, you can then wait 4-5 seconds, and once the Freeze is about to end, unleash your Arrows. The amount of damage you can do with this spell combo is absolutely insane, so it’s a must-try! Golem and Arrows – The Zap will not suffice when working with heavier tanks. Although it may be necessary to stun the Inferno Tower, you should always carry Arrows in your slots too. They will actually eliminate swarms of Golem counter units, never just harm them. Even under levelled Arrows are able to take out Minion Hordes that are up to 3-4 levels higher. Lumberjack and Arrows – Swarm units are the most common counter to Lumber Jack, excluding the Mini P.E.K.K.A. The Arrows can funnel him and any support units straight to the Tower! Hog Rider And Arrows – An effective alternative to one of my favorite pushes, HogLog, this will create the same effect, eliminating any troops that the enemy may drop as counters. Unlike Zap, Arrows can devastate Goblins or even Archers, and this is therefore an especially useful move when your enemy is low on Elixir. Hog Rider, Arrows, Ice Spirit, Ice Golem, Freeze, Spear Goblins, Valkyrie, Cannon – I am actually using this exact Deck, but with Log instead of Arrows. It is anti-meta and has been performing surprisingly well at 3k+ cups. I took some inspiration from The Frozen Hog Deck from the King’s Cup, and I enjoy playing it! Freeze placement and timing is key! 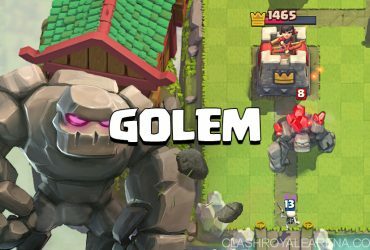 Golem, Ice Golem, Musketeer, Arrows, Inferno Tower, Elixir Pump, Mega Minion, Goblins – A slightly experimental Golem Deck, inspired by Chief Pat’s double Golem beatdown video. Arrows can clear the way for the Golem, and Mega Minion and Goblins will help defensively with your Elixir Collector, dealing with Miner efficiently and speedily. Hog Rider, Arrows, Zap, Goblins, Minion Horde, Mini P.E.K.K.A, Cannon, Guards/Ice Wizard – A very powerful control Deck, with the win condition push being Hog + Goblins/Zap. 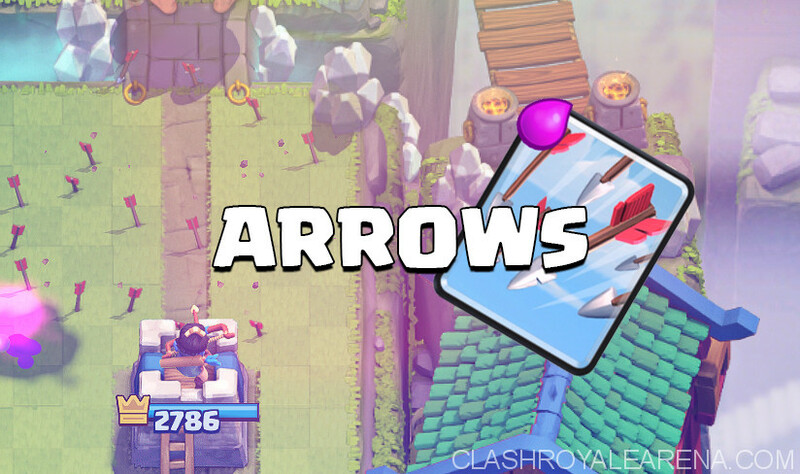 Arrows being incorporated completely removes the chance of being baited for spells, increasing this Decks effectiveness against the current meta, in Double Elixir mode too! 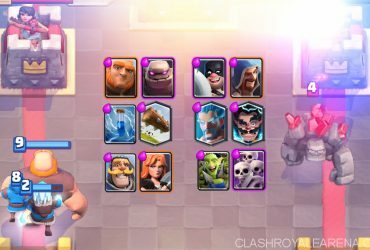 P.E.K.K.A, Prince, Arrows, Archers, Zap, Minions, Cannon, Elixir Collector – This is a tried and tested Deck, one of the most powerful P.E.K.K.A creations I have ever used. It has been working almost since the game started, using an immensely powerful heavy push combo to deal damage and claim 3 Crown wins. This involved pushing the P.E.K.K.A using the Prince’s charge, and utilizing the Archers as the core support and anchor Cards of the Deck! Tanks can be eliminated easily, luring with the Cannon and then choosing one or two high-DPS troops from the selection. It is a Deck that relies on instinct but is surprisingly easy to learn! Again, Arrows clear the path! Lava Hound, Arrows, Lightning, Wizard, Tombstone, Mega Minion, Inferno Dragon/Mini P.E.K.K.A, Guards/Ice Wizard – Another altered variation of the classic, mainstream Hound Tombstone meta Decks. Low levels can be used here (Arrows, Wizard, Guards, Ice Wizard), and it combines control with heavier siege elements! This is currently an amazingly powerful Deck, also incorporating airfecta features! Since Arrows is a spell, there is not much to say on the topic of countering, but rather, baiting. This is a very popular technique, involving forcing the Arrows out of your enemy’s hand, enabling you to push with even more cheap, glass cannon style Cards that can obliterate your enemy. Never drop Minion Horde straight off the bat. This is essentially a ‘rule-of-the-duel’ – doing this, even to cycle round, will almost indefinitely result in uneven Elixir trades, and should be avoided at all costs. Minion Horde is best split down both lanes, to push in an irregular way, therefore allowing cheaper units such as Spirits and Goblins to draw out the Zap. Make sure you know your enemy’s rotation. 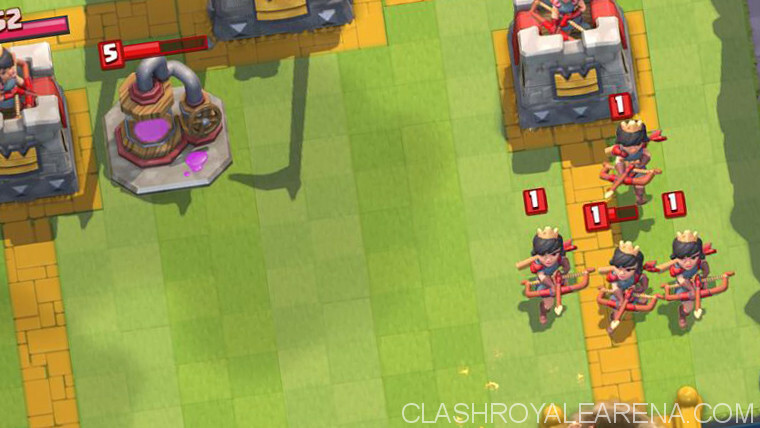 This way you are able to predict their Arrows very easily, allowing you to split-lane push more quickly. It also helps determine whether they may be using multiple swarm defense Cards. Most of all, hope you guys loved this Arrows guide! Don’t forget to check out my YouTube channel for more quality content!